Last week I tried EveryPlate meal kits. At $39 a week for three 2-serving meals, it’s one of the cheapest services out there – though when shipping is included each portion is $6.50, not the $5 they advertise. Premium dishes (those including steak, I’m guessing) are $3 more pp, or $9.50. My first week was free, as I got a one-time promo code from a current user. 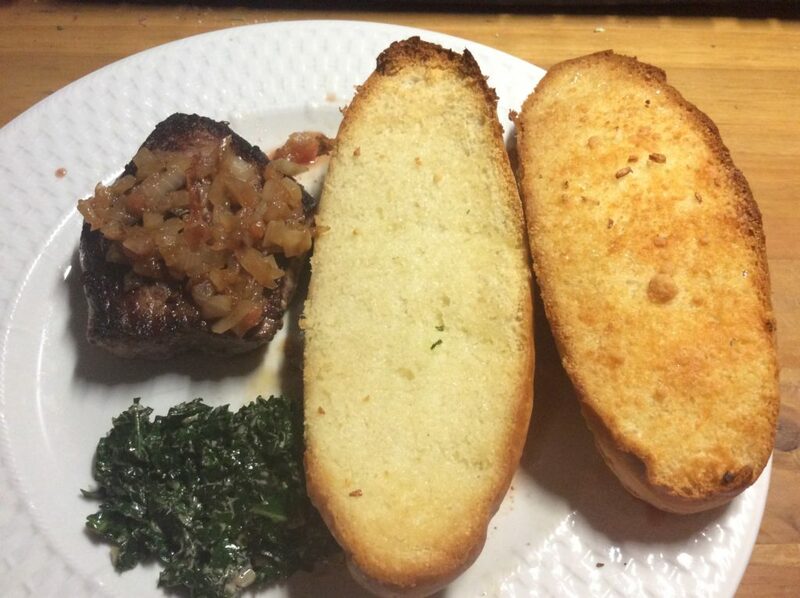 Of the three meals I had, the Steak Tagliata with Tomato Jam, Creamy Kale and Garlic Bread (a premium kit) was by far the best and as good as any meal I’ve gotten in a meal kit. The beef was ranch steak, a cut I’ve mostly gotten in meal kits, and it was tender and delicious – certainly a cut above the meat I get at Safeway. I also very much enjoy the tomato jam. It was easy to make and delicious. There was too much of it for the steak – but I liked it so much that I ate it by itself. The garlic bread consisted of two buns (they called them demi baguettes but they had a sweeter, softer consistency – they were clearly buns); each was individually wrapped in sealed plastic. They were surprisingly good as well. Finally, while I didn’t like the kale – not a surprise, as I don’t like most vegetables – my 14-yo ate it. The portion size was just right, neither of us were left hungry – though it may have been because of how much garlic bread we got. The ingredients were mostly fine, though the garlic was old and it came already sprouting. The tomato wasn’t ripe when it arrived, but it was just right two days later when I actually cooked this meal. Of course, by then the kale was just starting to dry out. Note, this meal kit requires the use of your own butter – most more expensive kits include it. I got this kit for free, with a special one-time code that someone gave me. The regular cost for this two serving kit is $19, including shipping. Use this link to get $20 off your first box. Pour oil in a saute pan and heat over medium-high heat. Add the chopped onion and cook until softened, stirring often. Add the tomato, vinegar and water. Cook, stirring frequently, until very soft – about 4-5 minutes. Stir in the sugar. Season with salt & pepper. Turn off heat and serve as a relish. Posts in this blog may contain affiliate links.